At the basic level, wound healing is crucial for preserving organ integrity after tissue loss. As a subject it is vast and encompasses some aspect from practically every field in biology. Because of the diversity and complexity of the cellular, biochemical and biophysical phenomena involved, the control of this important biological process is still poorly understood in spite of its intense study. In this chapter we can give only an introduction to some of the models that have been proposed for wound repair in the epidermis and, in the following chapter, of full-depth wounds which include the dermis. Much of the current modelling on wound healing, particularly the material we discuss here, is due to Cook, Maini, Sherratt, Tracqui and their coworkers; references will be given at the appropriate places here and in the following chapter. We shall be concerned only with mammalian wounds. BBB.F iguraro quam hie damu$,repr$fcntant. Figure 9.3. 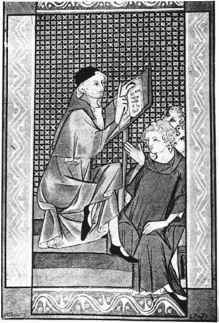 (a) Reputed painting of the great mediaeval surgeon Henri de Mondeville (1260(? 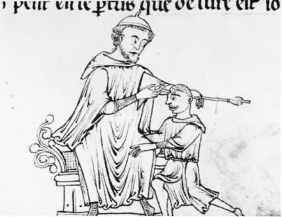 )-c1320) whose book on surgery was arguably the most influential book in the later mediaeval period. (Reproduced with permission of the Wellcome Trust Library) (b) Illustrations from a mediaeval medical book. It seems that no problem was viewed as untreatable in one way or another! 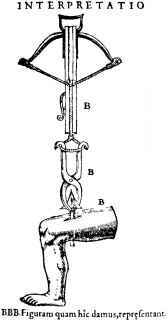 (c) Suggested method for removing an arrowhead. It was certainly quick. inwards. In an epidermal wound, wound closure—re-epithelialisation—is entirely due to epidermal migration which thus provides a way to study this process independently of wound contraction due to the dermis. In epidermal wound healing there are fundamental differences between adult and embryonic wound healing. In the next chapter we discuss full-depth wound healing; it is considerably more complex. For the rest of this chapter we shall only be concerned with epidermal wound healing, both adult and fetal. The mechanism of epidermal migration is still only partially understood which is, of course, one of the motivations for investigating possible models. An extensive review of epidermal wound healing is given by Sherratt (1991). Normal epidermal cells are non-motile. However, in the neighbourhood of the wound, they undergo marked phenotype alteration that gives the cells the ability to move via finger-like lamellipodia (Clark 1988). Although the main factor controlling cell movement seems to be contact inhibition (for example, Bereiter-Hahn 1986) there is probably regulation by the growth factor profile via chemotaxis, contact guidance and mitogenetic effects. Autoinhibitors are also involved and well documented; see the brief review by Sherratt and Murray (1992) who also discuss some of the clinical implications. Below we include in the models some aspects of activators and inhibitors in regulating the re-epithelialisation since they have been demonstrated in experiments. As a whole, the spreading epithelial sheet has one or two flattened cells at the advancing margin, whereas the epidermis behind this front is between two and four cells deep. Various mechanisms have been proposed for the movement of the sheet. In one, the 'rolling mechanism,' the leading cells are successively implanted as new basal cells and take on an oval or cuboidal shape and become embedded in the wound surface. Other cells roll over these. In the 'sliding mechanism,' on the other hand, the cells in the interior of the sheet respond passively to the pull of the marginal cells. 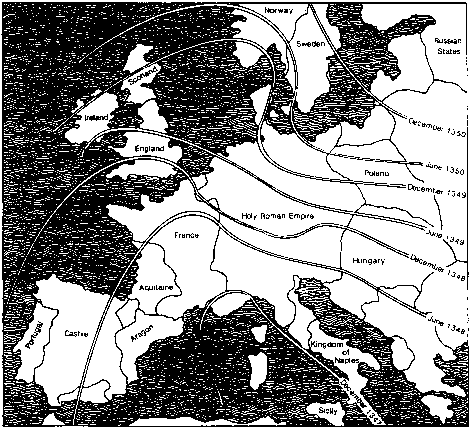 However, all of the migrating cells have the potential to be motile: for example, if a gap opens in the migrating sheet, cells at the boundary of this develop lamellipodia and move inwards to close the gap (Trinkaus 1984, a good source book on forces in embryogenesis). Although the morphological data of mammalian epidermal wound healing is plausibly explained by the rolling mechanism unequivocal evidence is lacking, whereas the sliding mechanism is well documented in simpler systems such as amphibian epidermal wound closure (Radice 1980). After injury there is no immediate increase in the rate of cell generation above the normal mitotic rate found in epidermis; epidermal migration is essentially a spreading out of the existing cells. However, soon after the onset of epidermal migration, mitotic activity increases in a band (about 1 mm thick) of the new epidermis near the wound edge which provides an additional population of cells at this source (Bereiter-Hahn 1986). The greatest mitotic activity is actually at the wound edge, where it can be as much as 15 times the rate in normal epidermis (Danjo et al. 1987); moving outwards, activity decreases rapidly across the band. The stimulus for this increase in mitotic activity is still uncertain; various factors have been proposed. Two factors that are certainly involved are the absence of contact inhibition, which applies to mitosis as well as to cell motion (Clark 1988), and change in cell shape: as the cells spread out they become flatter, which tends to increase their rate of division (Folkman and Moscona 1978). There is also experimental evidence, which we now briefly review, for production by epidermal cells both of chemicals that inhibit mitosis and of chemicals that stimulate it. The evidence for inhibitory growth regulators is considerable. There are two established epidermal inhibitors, which act at different points in the cell cycle. Their chemical properties are summarized by Fremuth (1984). Experimental work to investigate dose-response relationships has shown a general increase in inhibitory effect with dosage although beyond this it is inconclusive. Yamaguchi et al. (1974) investigated the variation of proliferation rate with time near the edge of wound in mice, and concluded that inhibition occurs at three distinct points in the cell cycle. Sherratt and Murray (1992) briefly summarize the arguments for an inhibitor role. With regard to epidermal growth activators produced by epidermal cells themselves, evidence for these is given by Eisinger et al. (1988a,b), respectively in vivo and in vitro studies. In the in vivo study, an extract derived from epidermal cell cultures was found to increase the rate of epidermal migration when applied, on a dressing, to wounds in pigs. In the in vitro study, the same extract was found to increase the growth rate of cultures of epidermal cells. More recently Werner et al. (1994) have shown that the mitotic activator keratin-ocyte growth factor is an important regulator in epidermal wound healing. This is produced in the dermis, but in response to epidermal signals, as an early response to injury.